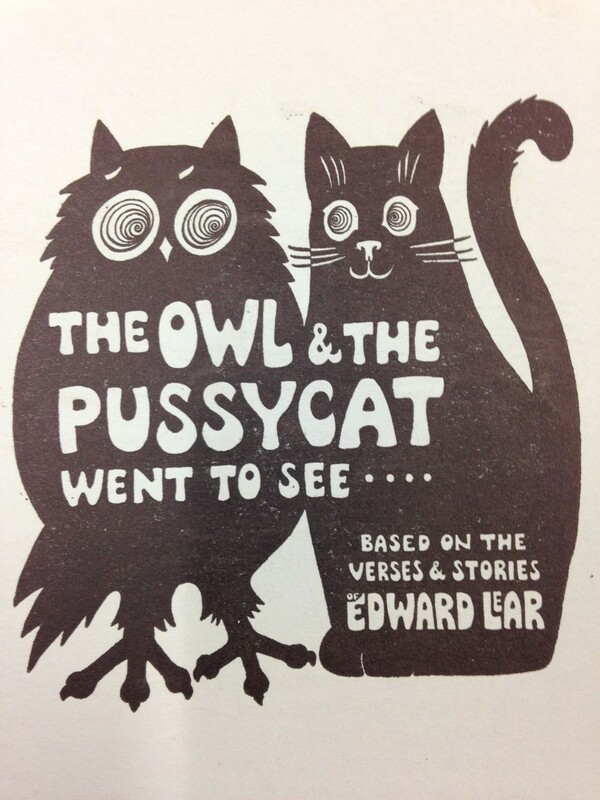 Being invited to Chichester to direct OWL meant a significant upgrade in production values. Peter, an avuncular and generous man, made sure that the show was produced to a high standard. I never felt that anyone at the theatre was treating it as a third division product, which in those days was often the accepted attitude. Paul Rogerson, the General Manager and Robert Selbie, the Administrator, were both very helpful when organising auditions, rehearsal times, contracts, publicity and all the other things which over the years I had become used to supervising myself. At Chichester I really felt cushioned. 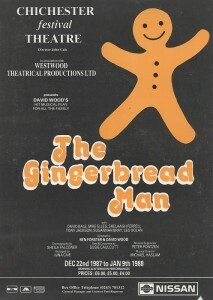 In 1987, John Gale got in touch to see if The Gingerbread Man might be available to play a Christmas season. 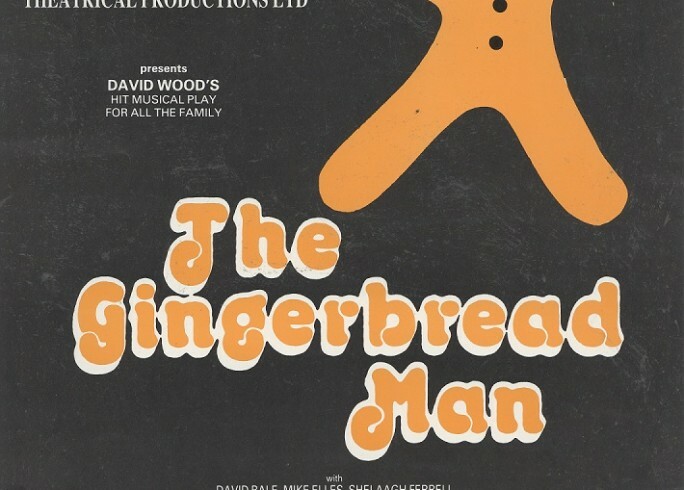 He had already booked an evening production, Daisy Pulls It Off, and wondered whether The Gingerbread Man might fit on top for matinee performances. 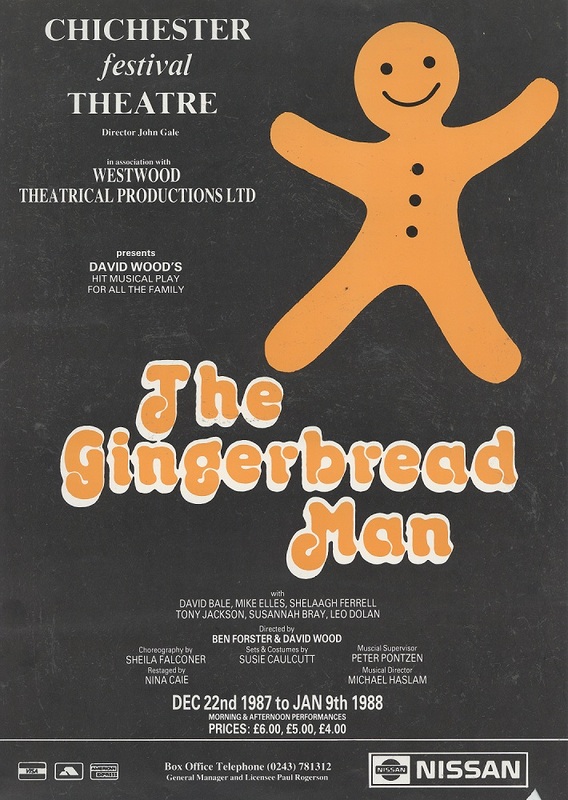 The set of The Gingerbread man, designed by Susie Caulcutt, was a standing structure representing the worktop and shelves of an antique Welsh Dresser. It was self-contained, so could conveniently fit inside another set. Most of the cast had played in the show before, though not necessarily with one another, and I much enjoyed returning to Chichester to direct. In 2006 I was pleased to learn that Jonathan Church had been appointed the new Artistic Director. I had known Jonathan since he ran Salisbury Playhouse, and had worked with him at Birmingham Rep, when he directed a Christmas production, followed by a tour, of my adaptation of Roald Dahl’s The Witches. During Jonathan’s first couple of years at the Festival Theatre, my mother had several spells in St Richard’s Hospital, which meant I visited Chichester quite regularly. I would occasionally pop in to see Jonathan. One day in 2008 we were having a coffee in the open air outside the Minerva when a young man approached. I thought he wanted to speak to Jonathan, who introduced him as Angus Jackson. In fact he wanted to speak to me. About twenty years earlier, when he was about 16, he had written to me for advice. He wanted to go into the theatre, but had been warned about what a precarious profession it could be. I invited him to meet me at the Monmouth Street Coffee House in London, where I did my best to dissuade him from taking up the theatre as a profession unless he was really passionate about it. It was very rewarding to realise that he had indeed succeeded in his ambitions, and now was an Associate Director at Chichester. 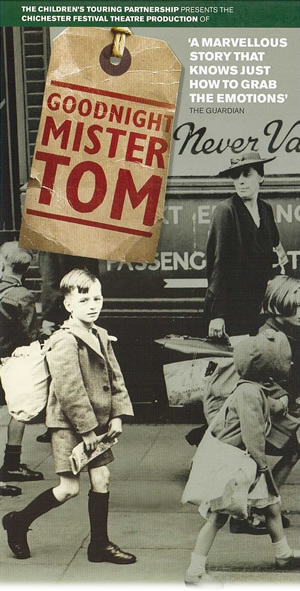 For many years I had tried to obtain the stage rights on Michelle Magorian’s brilliant novel Goodnight Mister Tom. Remembering that Jonathan Church had expressed interest in the project when he was at Birmingham Rep, I rang him to see if he might be interested in the play for Chichester. I thought I would have to wait a couple of weeks, but within minutes Jonathan rang back offering to commission Goodnight Mr Tom for Chichester. He brought in Edward Snape, who was trying to set up a company called the Children’ s Touring Partnership, which aimed, with Arts Council help, to take theatre for older children, on a large scale, into the mainstream UK theatres. I had worked with Edward several times, on productions of The BFG and Fimbles, and felt that a co-production of Goodnight Mr Tom with Chichester was an excellent idea. When the question of a director was mentioned I immediately thought of Angus, who was still working at Chichester. This idea was accepted, and Angus started working with me on script revisions. Sometimes in children’s plays it is necessary to employ young adult actors to play children. This is not just for financial reasons, to avoid paying for chaperones and tutors, it is also because often the child protagonist is the motor of the play and the actor needs to be able to sustain a demanding performance many times. With Goodnight Mr Tom, I felt that we needed real children, in order to achieve the vulnerability of William and the exuberant eccentricities of Zach. Guided by Jo Hawes, the children’s casting director, we found some splendid young actors, some from stage schools, some not. Another important element was Sammy, the dog. Using live animals on stage is always a risk, but I knew that Sammy was a very important character in the story. The idea of puppetry, bearing in mind the huge success of War Horse, was explored, and Toby Olié, who had been a puppeteer in the original production of War Horse, made a brilliant puppet and trained Laura Cubitt to operate it. Needless to say, Sammy received a great reaction and stole many of the reviews! The play opened on February 2nd, 2011 at Chichester, before embarking on tour. The response was heart-warming in the extreme. My long wait to be able to adapt Michelle’s book was vindicated by the reaction of the huge audiences, young and old alike. 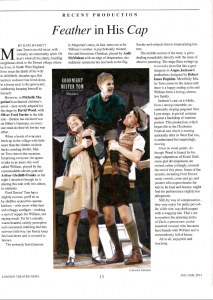 Because the play is about an evacuee in World War Two, the subject matter fitted with the National Curriculum, so school parties were happy to come. And many evacuees, now elderly, plus their children and grandchildren, came to relive their experiences or learn more about them. We achieved a thrilling bonus by winning the Olivier Award 2013 for Best Entertainment & Family. Jonathan and Edward generously allowed Angus and me to accept the Award, on the stage of the Royal Opera House Covent Garden. It was a memorable night. 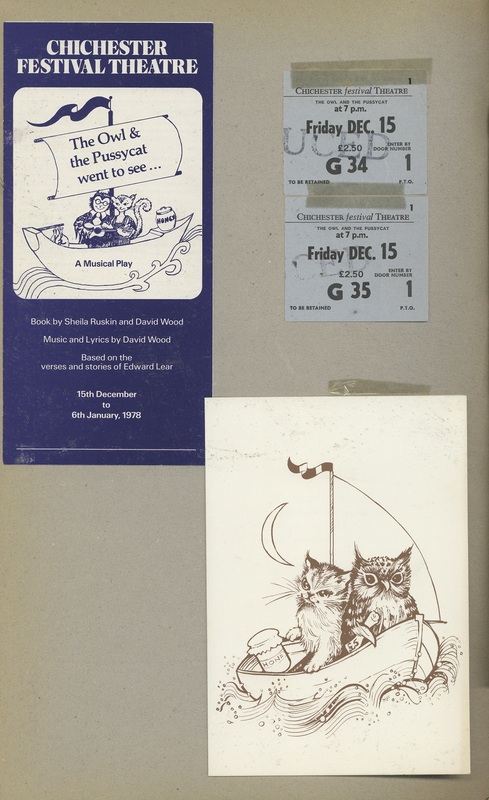 I want to acknowledge how Chichester has played a considerable role in increasing the status and profile of theatre for children and young people from my experience with Owl in 1978 to the present day. When I started, the interest in this area was minimal. It has been a privilege to be part of the change of attitude towards the children’s theatre movement that has significantly changed the landscape. One of the most significant achievements at Chichester has been the introduction and flourishing of its Youth Theatre. For thirty years it has inspired many, many young people, giving them performance experience as well as workshops in all aspects of theatre. When Dale Rooks became Youth Theatre/Education Director, with great skill and flair she developed the Youth Theatre so significantly that with the support of Jonathan Church, they have presented the main Christmas show in the Festival Theatre auditorium for a decade or more.